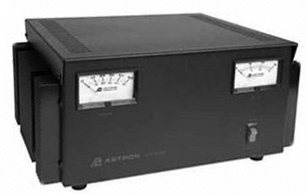 The Astron RS-50M is a high quality, linear design power supply providing 13.8 VDC at up to 37 Amps continuous of 50 Amps ICS. The front panel features separate meters for voltage and ampherage plus and illuminated on/off power switch. The rear panel has a large heat sink and heavy binding posts.